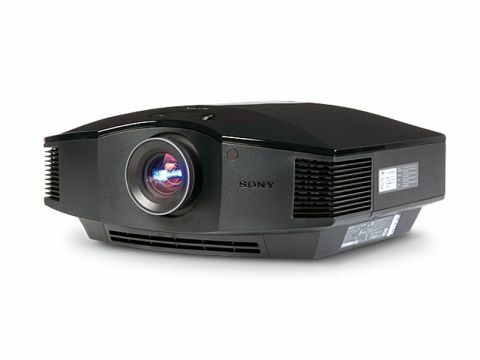 With JVC promising all sorts of high-level upgrades for its imminent series of new D-ILA projectors, Sony is under pressure as it rolls out its annual updates to its rival SXRD PJs, such as this new offering, The Sony VPL-HW20. I've already seen and been impressed with a preview model of Sony's SXRD 3D projector, the VW90ES, but now it's the turn of what will likely be the brand's new 'mass market' SXRD option. What's more, this is a finished review sample, so any serious flaws I find will be too late for Sony to fix! On receiving the HW20, my initial thoughts were that it was going to replace last year's very likeable VPL-HW15 model, but this is not the case. Apparently, the HW15 is going to continue, with the HW20 slotting above it in the range and adding around £500 to the HW15's price (unless the HW15 starts to quickly become heavily discounted). Obviously, if the HW20 is going to be positioned above the HW15, it needs to have something extra to offer, and I was pleasantly surprised to find just how large that bonus is. For it turns out that, rather than just incrementally improving on the previous SXRD chip design and implementation, Sony has gone back to the drawing board and has not only created a wholly new chipset for the HW20 (featuring even finer inter-pixel spacing than the previous version), but also introduced a completely new optical system. As a result, Sony reckons that it's been able to boost the HW20's contrast and brightness levels by around 30 per cent each, compared with the HW15, resulting in claimed 80,000:1 contrast ratio and 1300 ANSI Lumens brightness figures. These are both fine numbers to find quoted for a reasonably affordable home cinema projector, even if I do have to stress that the 80,000:1 contrast ratio figure is a dynamic one (measured with the assistance of an active, automatic iris), rather than a native figure such as those claimed for JVC's more expensive D-ILA lightboxes. Dynamic iris systems are traditionally viewed with scepticism by serious home cinema buffs and with good reason. For if they're not done well they can cause distracting over-aggressive jumps in overall brightness levels, or prove pretty poor judges of the best balance between brightness and contrast that a particular shot or scene demands. However, the HW20 goes way further than most sub-£3K projectors to counter these potential dynamic iris problems. It gives end users much more control over exactly how much involvement the dynamic iris has in picture production. You can, for instance, adjust the speed of the iris's reactions and the 'default' amount of light it lets through. So, for example, you can reduce its aggressiveness if you've got a fully blacked-out room. Or you can start it off set to a higher brightness point if you've got a bit of ambient light to compete with. You can also turn the dynamic iris off entirely. As a home cinema fan, whenever I'm thinking about projectors at around the £2K-£3K price point, it's impossible not to have in mind Panasonic's PT-AE4000. This is partly because of its sterling, if not quite stellar performance, but mostly because of the prodigious toolset it carries for optimising picture setup. Sony may have had Panasonic's flexible friend in mind when compiling its own calibration tools, because options include a full colour management system via Sony's Real Colour Processor (RCP), high and low lamp output levels, gamma tweaks and a black booster. The RCP takes an unusually visual approach to picture calibration. For instance, when you choose a particular primary colour – be it red, green, blue, cyan, magenta or yellow – only that colour remains in the picture, so that you can focus on it in isolation. Adjustments can be done via a circular graph of the colour spectrum combined with some numeric tuning of colour and hue. While I admire the thinking behind the RCP and suspect it might engage novice tinkerers more than the standard colour calibration approach, I found the RCP a bit too unconventional and long-winded in its presentation for comfortable use. But all the same, there's no doubting its innate cleverness or ability to really improve pictures if you're patient with it. In aesthetic and connection terms the HW20 is all but identical to the HW15. This is no bad thing given that model's sleek, glossy, tastefully sculpted looks and provision of two HDMIs and a D-Sub PC jack among its connections. The only major absentee is a 12V trigger, which will annoy those hoping for integrated system control. The enhancements wrought on the HW20's picture quality by the improved chipset and optics are immediately and impressively apparent. If the HW15 had a fault, it was that pictures looked just a touch insipid versus what rivals such as Epson were doing. But the HW20 puts this right fairly comprehensively. For one thing, its black level response is much better, allowing it to show the dark sequence of the ill-fated Dallas vent expedition on the new Alien Blu-ray with a really natural touch. I mean this in terms of both the lack of greyness hanging over the darkest corners, and the amount of shadow detail lurking in every nook and cranny of the labyrinthine pipes. Also key to the image's dynamism is a much improved colour response. This finds the gorgeously vibrant colours of the How To Train Your Dragon Blu-ray really powering off the screen, especially given the very healthy black counterpoint to all the new-found colour gymnastics. It's apparent, too, that the new chipset and optics have allowed Sony to produce a much better innate contrast performance with the HW20, since you don't have to compromise brightness levels, as much as you do with the HW15, in order to achieve a believable black colour. In fact, the picture looks more than satisfyingly dynamic even without the dynamic iris turned on. That said the dynamic iris is actually a very good example of its art, reacting quickly and cleverly enough not to cause much overt saturation or brightness shifting. Add to the already impressive mix, good motion handling and some excellent sharpness and detailing from HD sources, and you've got a projector that's ridiculously accomplished for its sub £2,500 price level. In fact, aside from the fact that I had to spend more time than I'd have liked tweaking its colours, I struggled to really find fault with the HW20 considering its price point.